Here you'll find a number of our favourite crayon crafts, including some great crayon recycled craft ideas. We have instructions for melting crayons down to make new shapes and sizes, as well as some ideas for making sun-catchers and decorations out of crayon shavings. 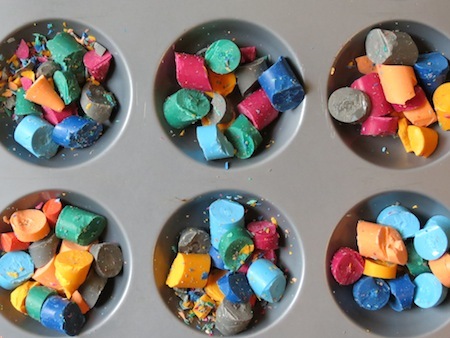 Recycle Old Crayons to Make New Ones! I have read about this on a number of great craft blogs and had to have a go. It's a quick and easy kids craft that produces fantastic results - new crayons in different shapes and sizes! TIP: An adult will need to be present throughout, as it involves a knife and an oven! A bunch of old crayons with their paper wrappers removed (a great activity for toddlers and smaller kids to get involved in, even if they can't do the rest). 1. 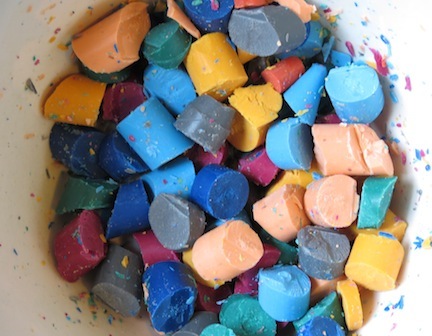 Remove all traces of paper wrapper on the crayons and chop them into smallish pieces into a bowl. 2. 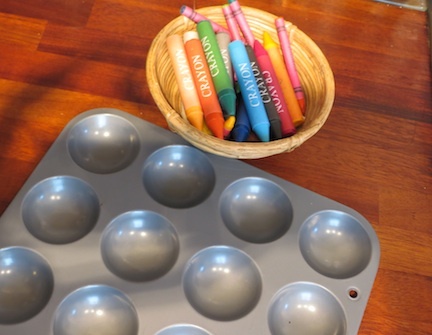 Fill your muffin tins with roughly equal amounts of crayon. Place in the oven at 150C (300F) for 10-12 minutes. 3. Remove the tin once they are melted - do this carefully as the crayons will be melted and very runny. 4. 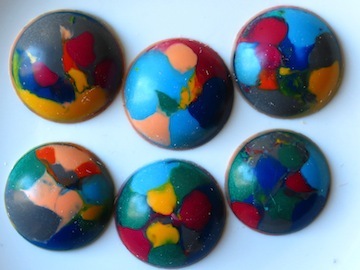 Leave your melted crayons to cool in the tin for about 30mins. Tip out onto a soft surface so that they don't break and turn over. TIP: I opened our windows and left the oven door open too, as there was a bit of a smell after baking crayons. Obviously, keep a close watch on small kids if you leave the oven door open.